cross-section of an earl grey pear muffin. The beauty of making do with what you have, and using up stuff in the pantry, is the surprisingly fancy combinations this frugal activity can inspire. The following recipe is a result of putting two and two together: cheap beurre bosc pears from the market and earl grey tea bags nearing their expiration date. My baking adventures suddenly sound that much more sophisticated. 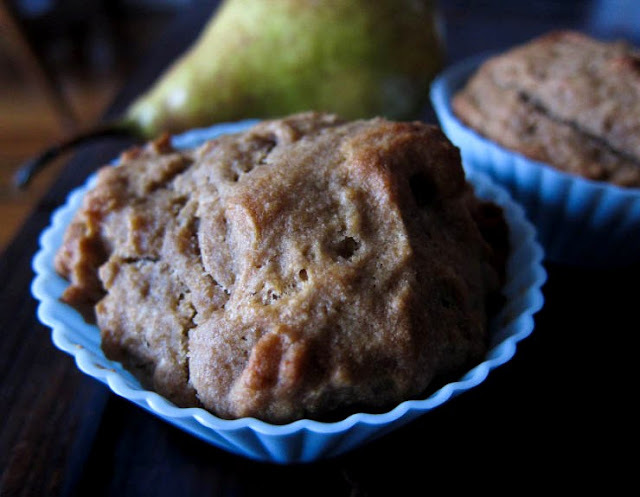 Me: Earl grey pear muffins. Simon: Sounds a bit pretentious, doesn't it? Forget about winning prestige points on the name alone, though, the muffins did actually live up to my expectations. The pears, delicately infused with a buttery earl grey broth, radiate with a warm complexity. Likewise, the batter takes in soft, sensual hints of the bergamot, black tea, and pear flavours, then diffuses them gently to the muffin-eater. Oh, and just in case you were wondering, Simon couldn't get enough of my pretentious muffins. Simon (taking a bite): So how many did you make? Simon: So that means I can have six muffins, right? Do I get six muffins? 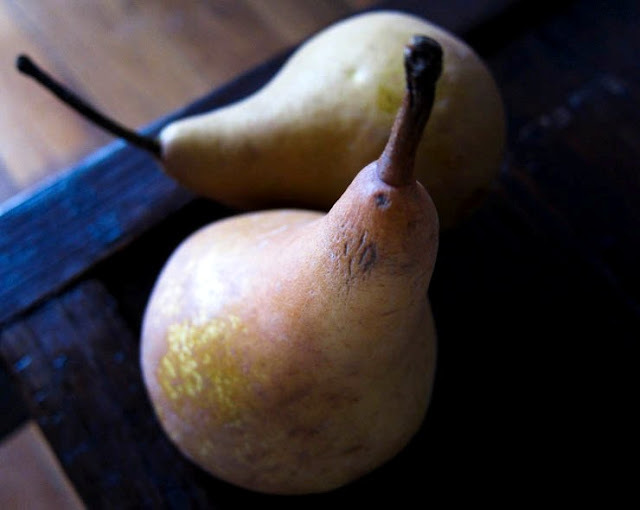 with their russet-and-gold appearance, beurre bosc pears exude romance and charm. Pre-heat oven to 180°C (360°F) fan-forced, or 200°C (390°F) regular. Steep earl grey tea in freshly boiled hot water for at least 5 minutes. Once they are thoroughly steeped, remove the tea. If using tea bags, diligently squeeze the bags so you get as much of the tea infusion as possible. Simmer pear cubes with earl grey tea and butter over a low medium heat for 5 minutes or until just tender. Let it cool slightly. Set aside half the pear cubes, and puree the remaining mixture of pear cubes, earl grey and melted butter. 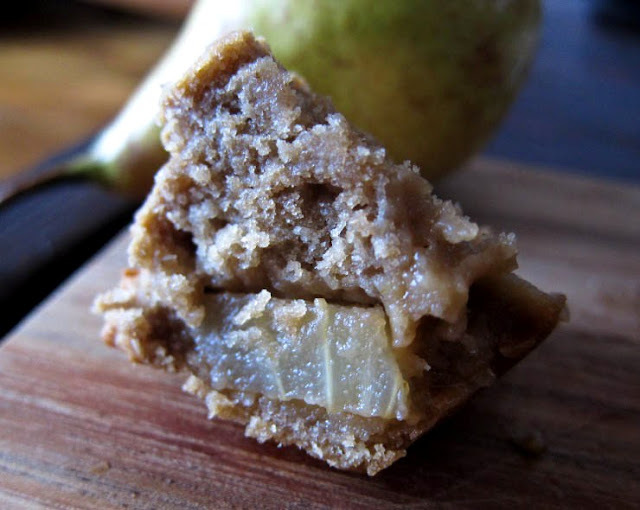 Stir together pear cubes and buttery earl grey pear puree. Place flour, sugar and baking powder in a bowl and make a well in the centre. Pour the pear mixture into the centre of the bowl and stir gently a few times until the wet and dry ingredients just combine to create a thick batter. Divide batter evenly amongst 6 lightly greased muffin cases. 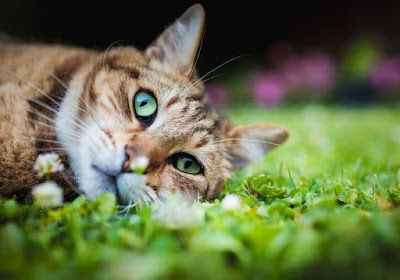 Bake in the oven for approximately 25 minutes or until a light earthy brown. Let the muffins cool slightly for about 10 minutes, then serve. They're best eaten warm. If you have a very fine-textured whole-wheat flour like atta flour, feel free to substitute 1 cup in lieu of the 1/2 cup plain, 1/2 cup wholemeal mix. Substitute butter with a vegan spread e.g. Nuttelex, Earth Balance etc. for vegan muffins. earl grey pear muffins, warm from the oven. I don't drink earl grey tea but I love it in desserts and these look delicious! Had earl grey ice cream at a restaurant recently which was a complete revelation. Earl grey is indeed gorgeous in desserts. I've heard about earl grey ice cream - I can imagine how beautiful it tastes and it's definitely something I want to try someday. The inclusion of earl grey does really seem to add a little something something, doesn't it! I had no idea tea could go bad. I suppose I don't need to worry, at the rate I drink it. Tea would last way past their expiry date if you keep them well, I'd imagine. Hmmm, I should try earl grey cookies next. Bring on the pretentiousness! ;) P.S. The pears do look ever so sensuous, don't they? Earl Grey tea has always been my favorite, and your muffins look insanely moist. Ohhh, I was looking at my slightly aged pears this morning wondering what to do with them ... I do believe they will become muffins this weekend! Oh, do let me know how it goes if you end up trying it! He can't be serious about eating all 6 muffins! I love the smugness that comes with resting your case. Not something I get to experience very often though—the man of my household is one of the pickiest eaters I know! Is Rooibos pretentious?? I drink it cos it's caffeine free... nooooo!!! Oh, I love Rooibos! If that's pretentious, bring on the pretentiousness. Bring IT. Really great flavour combination Leaf! These are so not pretentious - just very dainty! I must have one of these! Gosh it looks good and sounds fantastic. This will be a lovely recipe to prepare when the pears in my orchard ripen. Haha, I wish Brad was as enthusiastic about me baking, but he's not so much of a sweet tooth. This sounds like a lovely combination to have for afternoon tea...with a cup of tea! Hahaha! Not too pretentious to finish off all the muffins, is he?? A great testament to your baking skills! These look gorgeous. Wow what a wonderful combination love the combo of tea + pear :) yum! Not all my haphazard baking adventures come out a success! I'm glad this one did. :D Beurre bosc pears really are lovely, aren't they. And yes, look me up if you're in the neighbourhood! There is nothing pretentious about these! They sound amazing and I love the sound of the combination! Yay! Ha, exactly! Hurrah for posh earl grey treats!